NBCDFW.com compiled cell-phone video clips of the fire; view more videos at: http://nbcdfw.com. Stunned attendees at the State Fair of Texas witnessed the iconic Big Tex go up in flames Friday morning. Some fabric that made up the towering structure's hand and sleeves could still be seen as firefighters gathered around the scorched area. Big Tex's 75-gallon hat, 50-pound belt buckle and slow drawl -- "Howdy, folks!" -- have been greeting fair visitors since 1952. This year's fair, which closes Sunday, had been celebrating Big Tex's 60th birthday. "It's a great loss for us because of its icon stature," fair spokeswoman Sue Gooding said. Gooding said she didn't know the cause of the fire but did note electrical controls move Big Tex's mouth and head. Gooding noted that no one was injured in the fire and added that she expects him to be back for next year's state fair. "He'll be back, bigger and better than ever," she said. "Dallas is about Big Things and #BigTex was symbolic of that. 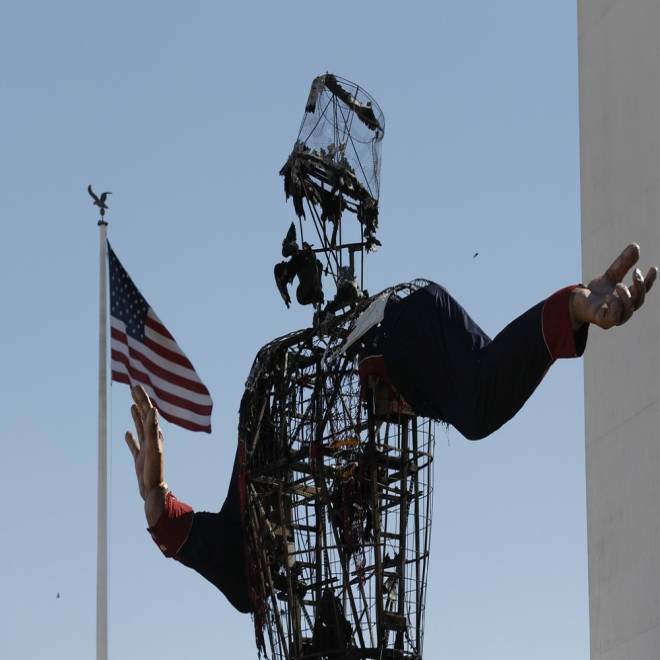 We will rebuild Big Tex bigger and better for the 21st Century," Dallas Mayor Mike Rawlings said on Twitter. 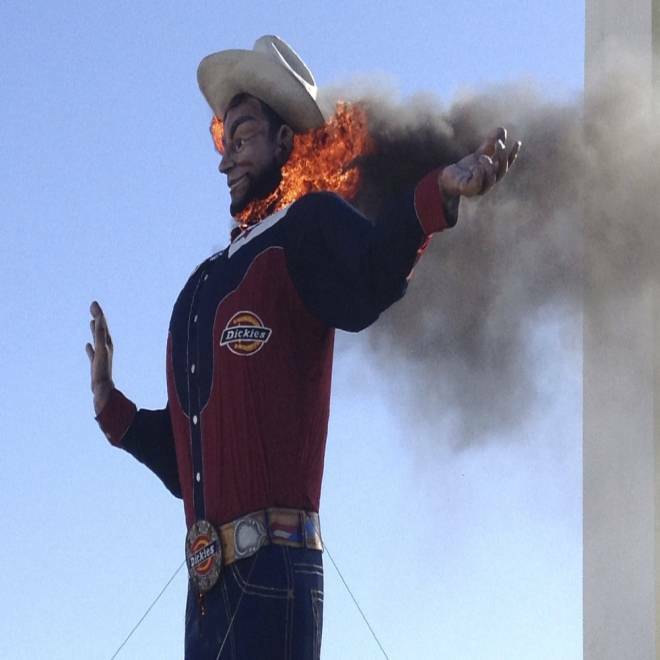 Fire begins to engulf "Big Tex" on Friday in Dallas. The burned remains of Big Tex stand at the State Fair of Texas on Friday in Dallas. Bill Bragg, the voice of Big Tex, said all the fair's safety measures were in place and no one was in any danger. Bragg says the fair will rebuild the iconic statue for next year's fair. “Dickies® has proudly been the official clothier of Big Tex for 15 years. Although we’re saddened by today’s news, we’re confident that together with the State Fair of Texas, Big Tex will return better than ever in new Dickies apparel,” said Matthew McCartin, VP of Marketing, Williamson-Dickie Mfg. 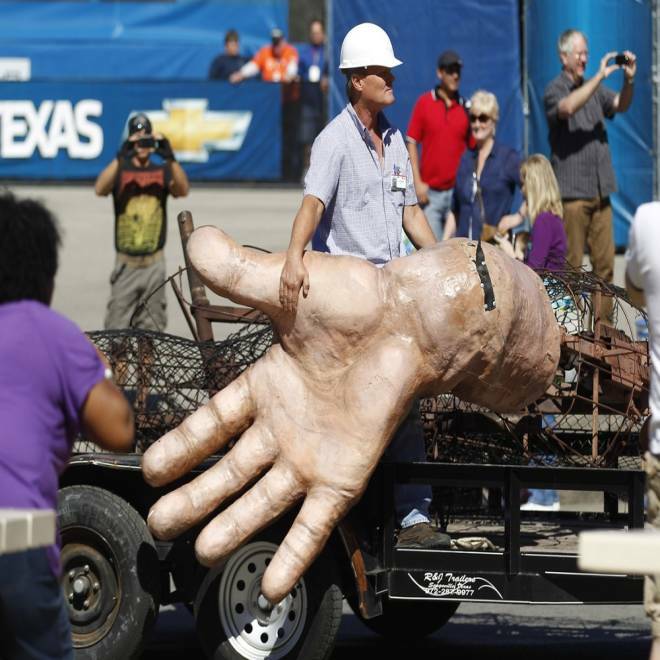 Co.
A worker hangs onto a surviving hand from "Big Tex" on Friday. Fair organizers are currently dismantling the framework that was not damaged with a crane. Ironically, Big Tex had only one more weekend to greet visitors at the fair -- it closes for this year on Oct. 21. The 52-foot-tall statue that welcomes State Fair of Texas visitors caught fire Friday, and an investigation to determine the cause of the flames is underway. NBC's Brian Williams reports.